“Kathleen McCarthy is invited to speak. She takes her place among her fellow brothers and sisters in the crowd. She sits, hands folded in her lap, most people not knowing that she is whom they came to see. The host introduces her. Some are eager to hear her words; some are not sure why they came; yet others are skeptical, even hardened. Kathleen reaches out…her stories are light, humorous, and tug at the heartstrings. Little by little, she pulls the crowd deeper and deeper into the depths of the pain and beauty of her own life, reflecting the beauty of Christ himself. Time passes and the congregation is laughing, weeping, and rejoicing in the love and light of the Divine. The crowd is quick to realize that they are in the presence of a gifted speaker. Their attendance is not coincidental. They were called to be here. Kathleen, whom they have grown to know, has a fire about her…a burning fire that is melting even the most hardened of hearts. 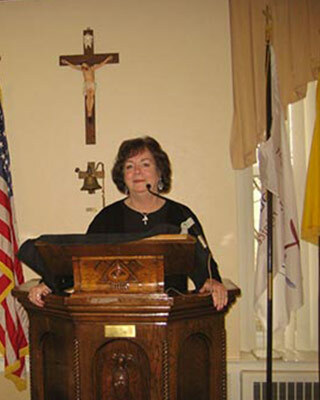 Would you like to bring Kathleen’s ministry to your parish or group event?